A year ago I discovered Cold Porcelain flowers on the internet and have been in love with them ever since. These flowers were handmade (without cutters ) a year back and have survived the test of time . None of them have cracked , faded or disintegrated ! This calls for celebrations as these amazing flowers are non-allergic, fresh , timeless and I have learnt to make them !! 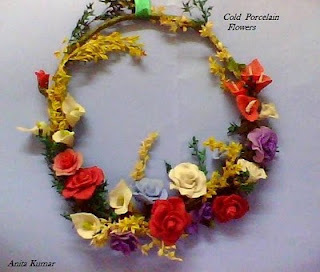 Now I feel that I should do something creative with the flowers accumulating in my home , maybe make some gift items like this wreath. All my vases are full of different cold porcelain flowers , latest being the pansies ! I keep doing different crafts but come back to Cold Porcelain again and again every month . I started with roses , my favourites, went on to make cala lily, daisies, gerbera, bonsai tree,dahlias, pansies . I have to perfect gerberas, carnations , orchids , peonies and many more , its challenging to make flowers without cutters. Cold Porcelain is also known as Italian dough craft , Spanish dough craft or Lamasa . It seems that the basic recipe takes the name of the country its used to make the dough-craft ! So there is Thai Clay , Japanese Clay with some variations , but all are air-drying home-made clays. There are also readymade air drying clays sold as branded items in the market. Its difficult to believe that beautiful flowers can be made with ingredients easily available in the kitchen. After a few trials and errors I was able to make the dough good enough for flower making on the humble stove in an old aluminium pan . Somehow I could not make the CP dough in the microwave and it got spoiled , it took a life of its own and refused to turn into a docile ball of clay. Cold Porcelain shrinks , so its really exciting to see what the creation looks like after drying !